Announcing the reprints of two Lovelace related books! 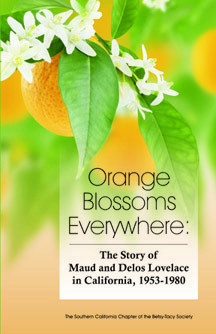 I’m excited to share the news that Minnesota Heritage Publishing will be reprinting One Stayed at Welcome by Maud and Delos Lovelace and Orange Blossoms Everywhere by the Southern California Chapter of the Betsy-Tacy Society. These books are planned for release this fall. Maud and Delos’s daughter, Merian Lovelace Kirchner, gave permission to the SCCBTS to use selections from the diaries of Maud Hart Lovelace so that more of her life can be shared with others. Although Delos Wheeler Lovelace did not keep journals, stories told by family and friends, as well as Maud’s diaries, bring to life the delightful and intense nature of this complex man. While this book focuses mainly on the Lovelaces’ first few years in California, it also tells the story of the final chapter in Maud and Delos’ life—their retirement years in the lovely tree-lined town of Claremont, California. ​Pre-publication orders are being taken now for One Stayed at Welcome and Orange Blossoms Everywhere in order to determine the number of books to be printed. Depending upon the number of pre-publication orders, the retail cost per book could increase after the October 1st deadline. You will also save on shipping by ordering both titles shipped to the same address. Books will be shipped on the expected release date of November 1, 2013. The deadline for pre-publication orders is October 1, 2013. Details for ordering are found on my website: http://www.mnheritage.com.